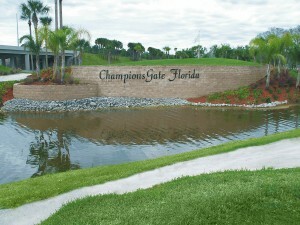 ChampionsGate Resort is a 1,392 acre Development of Regional Impact (DRI) located in Osceola and Polk Counties. Stillwater Environmental enhanced over 48 acres of herbaceous wetlands throughout the subject site and continued with the maintenance and monitoring of the enhancement areas for three (3) years eventually obtaining sign-off from the South Florida Water Management District (SFWMD) and the Southwest Florida Water Management District (SWFWMD). Wetland jurisdictional determinations as well as the preparation of the Environmental Resource Permit application for the last several phases were conducted with the SFWMD, the SWFWMD, and the U.S. Army Corps of Engineers. Our team has conducted extensive wildlife surveys on the DRI site to identify protected species. These species included gopher tortoises, Southeastern American Kestrels, Florida Scrub Jays, Sand Skinks and Bluetail Mole Skinks, Eastern Indigo Snake, and Florida Sandhill Cranes. The gopher tortoise population was successfully relocated to an approved Florida Fish and Wildlife Conservation Commission (FWC) long-term recipient site.